As I wrote about last week, I decided to do the 100 Day Project at the very last minute. I decided I would use some of the lessons I’ve learned from the 100 Day Project over the past few years, basically that a daily challenge gets you to create stuff you may not otherwise create without that structure. So I thought about a project I had hidden away in my “do this sometime in the future” mental file. I’m always fascinated by transparent colors and overlays of different colors using watercolors probably because that is one thing I can not do with solid colors of fabric sewn together. Our furry friends. Jasper on the left is just curious where Koa on the right is destrtuctive. Still sweet though. After starting, I know there’s a big difference between appreciating something and deciding to do it. But I rationalized that this would be helpful for my EcoMemory commissions because many commissions so far involve sunsets and sunrises over beaches or lakes. 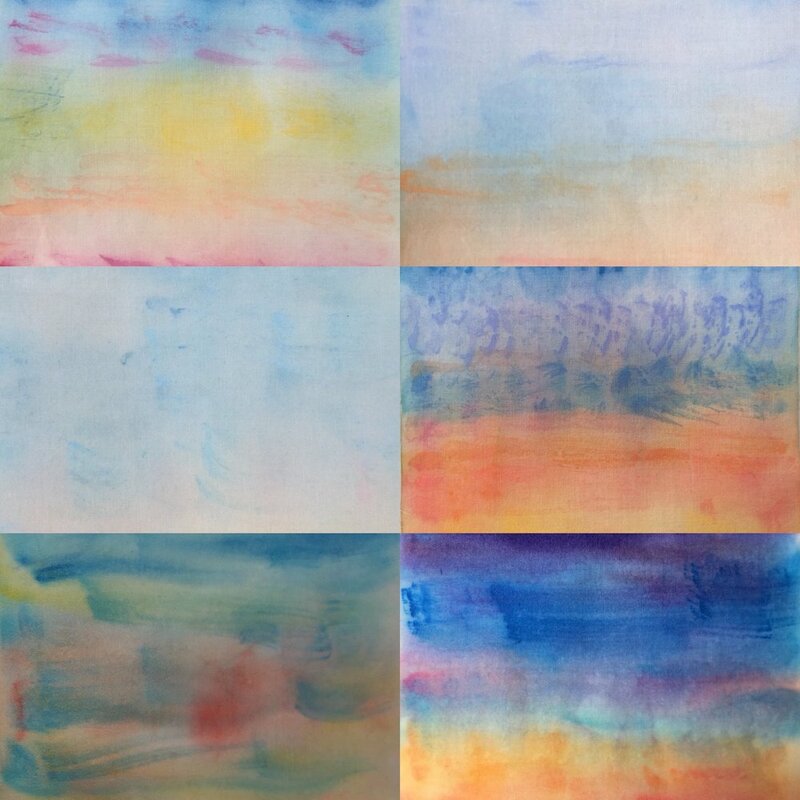 So this might be an interesting option to use watercolor painted fabric for those sunsets and sunrises. I haven’t made any examples of mixing these two types of fabric together in one piece yet so I’m not sure how it will look but I am having fun doing this 100 Day Project even if it does not work out for the EcoMemory commissions. The set up and clean up to do this project every day is much more complicated then sewing. Each day I do it, I’m getting a better more efficient routine. Unfortunately, I need to hide my supplies every night because one of our cats is very curious and will bite into plastic, fabric, and probably paint brushes as well. So I have to clean up every day. I guess that’s not the end of the world but it’s more of a commitment of time to do this every day. For now I’m focusing on sunrises. I plan to switch to a new theme after awhile. I’m considering making pillow covers with this 100 Days Project where I could make six pillows using 18 daily squares. We’ll see. This time I’m going to be a little more flexible and realize the important thing is creating every day and not worry about the end product yet. I am going to just keep doing it focusing on the sense of joy in the creative practice.